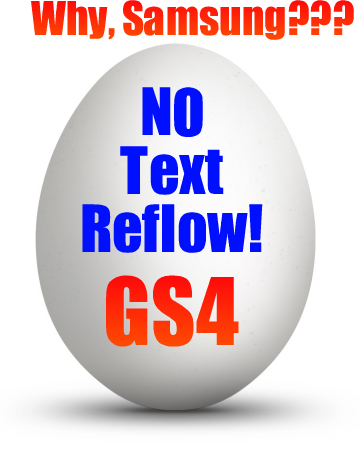 They went for broke on the Galaxy S4 with every useless "feature" you could imagine, but Samsung dropped a big fat egg when they left out the most usable feature that should have been included in the stock Android browser - Text Reflow. You can wave your hands to scroll, wave side-to-side to page through windows, and even tilt the phone to scroll up and down pages. It makes the browser very convenient, and I love having the ability to use the gesture-based constrols. The engineers at Samsung must have stayed up extra late with a big pot of coffee to make all of this happen. But what makes me want to grind the teeth out of my head is the fact that the stock Android browser does not come with text reflow. I can download a 3rd-party browser like Opera, or Maxthon, or even Chrome, all of which have text reflow. But when you are using a 3rd party browser, none of the advanced gestures work. They only work on the stock browser. My question is this... how could Samsung spend so much time coming up with such great browser add ons, but leave out something as simple and functional as text reflow? Why would they ignore this, while HTC has it built in with the stock browser on their flagship product, the HTC One? I don't have a clue. Doesn't make sense. This brings my frustration back to the forefront in the same way that it did back in my Apple days. I had an iPhone 3GS and was very jealous of the Android devices on the market that had dynamic text reflow. I had high hopes that Apple would bring text reflow to the iPhone 4, and I was sorely disappointed when they passed up on the opportunity and chose to remain with their heads up their rear ends on the issue. Samsung has surpassed the stupidity of Apple on snubbing text reflow by releasing the most advanced mobile browser on the market that has everything thrown in it but the kitchen sink... and text reflow. They have officially laid an ostrich egg on this. I hate to say that I am disappointed, but I am. I love my Samsung Galaxy S4 smartphone, and I would not think of trading it for anything. There is a zero percent chance of me going back to iOS, and I'm not really that excited about HTC products. So there's not chance that this issue is a deal breaker for me. But I sure would appreciate it if Samsung developers took a short coffee break from creating all these useless magical features just long enough to add one simple feature that could make all the difference in the world for people who use their smartphones for heavy reading.